This recipe can be made with or without crust. Both ways turn out great! If I’m feeling ambitious I will make it with crust… if I am not feeling that ambitious or if I’m just a little short on time, I will make it without the crust. 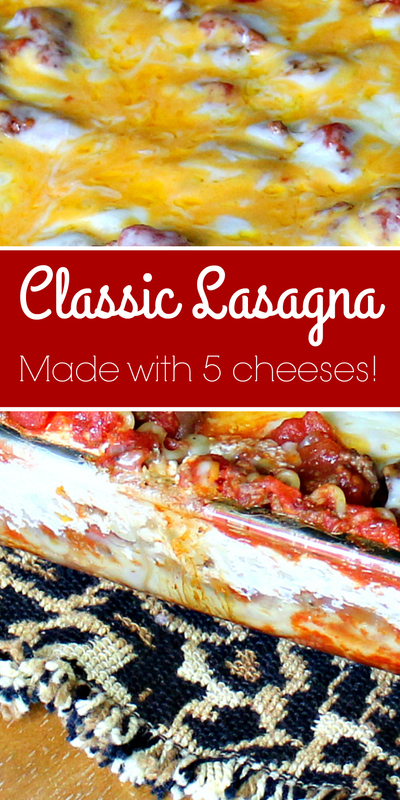 There is nothing like a good classic lasagna for supper, so today I am sharing my number one lasagna recipe with you! Now don’t be scared away by the “made with 5 cheeses” bit…. Any “one” type of cheese will work! I just love, love, love cheese and always have at least 10 different kinds in my fridge — and no, I’m not kidding! Step One: In a large skillet or frying pan, add ground beef, mushrooms, onions, Worcestershire sauce, salt and pepper. Cook on medium-high for about seven to ten minutes, or until fully cooked and then drain. Step Four: Cover the single layer of noodles with about half of the ground beef-sauce mixture. Make sure that the noodles are fully covered, and then lay down another single layer of noodles. Step Five: Spread the whole tub of cottage cheese over the second layer of noodles, and then cover the layer of cottage cheese with a layer of ricotta cheese…. Mmm! Step Six: Place another layer of noodles down over the cottage cheese/ricotta cheese layer, and then cover the noodles with the remainder or the ground beef-sauce mixture. Step Seven: Sprinkle the two cups of shredded cheese on top of everything, and then sprinkle on the Parmesan cheese. Step Eight: Cover with aluminum foil and bake for 350 degrees Fahrenheit for one hour. Remove the foil for the last 10 minutes of baking for a crispier top.